The news had leaked out yesterday on print media but it was finally confirmed by all vested parties (IRFU, Munster Rugby and Leinster Rugby) today. Nick McCarthy moves to Munster Rugby on a two year deal starting from next season. Hawkeye Sidekick reflects on the news. Munster Scrum Half Depth Chart Full? Nick McCarthy’s arrival means that there will be five scrum-halves in the Munster Rugby first team squad next season. Conor Murray will be on Ireland duty for a significant period next season so for the likes of James Hart, Neil Cronin (who signed a contract extension), Duncan Williams and now Nick McCarthy, it is an opportunity to stake the claim for the backup slot next season. It does seem to be a bit excessive for a potential fifth scrum half in the first team squad but given the injury issues of Hart and Cronin early doors this season, McCarthy’s name presumably was mentioned given his need to play more regularly next season. The Ann Arbor, MN native comes with a solid resume. The scrum-half played his schools rugby with St.Michael’s who are a massive conveyor belt of provincial talent. McCarthy represented Ireland at U20 level in 2015 and this coincided with the player joining Leinster Rugby in 2015 playing three times for the province (cameo roles). 2016 was a similar story given the stacked squad depth at the club and another three brief cameos followed. 2017-2018 season saw the player gain more game time, starting three times during this campaign. McCarthy scored three tries and played a total of 462 minutes. The 2018-2019 season has seen two appearances from the bench and with Luke McGrath and Jamison Gibson-Park vying for the scrum half starting berth, the decision to leave Leinster Rugby for playing reasons was an easy decision to make. It has being really hard to see consistent video footage of the player this season given the sufficient game minutes given (26 minutes). What we do know is that McCarthy has a solid skill set, fast distribution from the ruck a key trait. A solid kicking game to complement the passing game. It was hard to scrutinize the player given the stop / start nature of his Leinster Rugby career. Munster Rugby have taken the punt on the player, it is up to the player to hit the ground running during preseason next summer to impress the coaches to give him the game time that he craves. Another ex-Leinster Rugby alumni joins the rank, whether this player will make an impression is debatable given the number of first team scrum halves at the club. 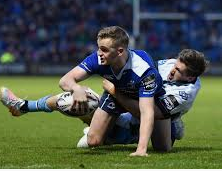 The reaction of Leinster Rugby is of disappointment but the talent pool at the club is stacked and no doubt more scrum half prospects will replace McCarthy in the depth chart and look to stake their claim for action. Time will tell on how shrewd this signing will be from both the player and Munster Rugby. This entry was posted in rugby and tagged leinster, munster, rugby. Bookmark the permalink.